Tonight at 8pm Sky Arts premieres our latest contribution to the Hot Ticket strand, Elizabeth, which is a co-production with the Royal Opera House. 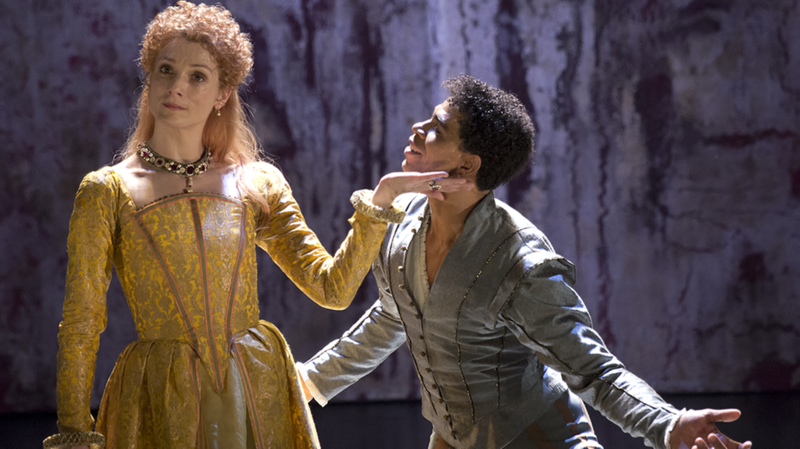 If I can be immodest for a moment, it is a truly gorgeous dance performance with Carlos Acosta and Zenaida Yanowsky, beautifully choreographed by Will Tuckett and expertly transferred to the screen by Ross MacGibbon. Created by Will Tuckett with playwright and librettist Alasdair Middleton (who co-directed for the stage), Elizabeth was presented in the Linbury studio theatre last month, and tonight’s recording was shot during one of the scheduled performances. This taping was then enhanced with a further day’s shoot without an audience. As Will Tuckett has explained, ‘Elizabeth’s love of dance, the arts and her quick-witted, wicked sense of humour are all evident in her own writing… I felt that dance could provide another take on how these elements and this extraordinary woman could be viewed’. Middleton’s script draws on Elizabeth’s writings and those of her contemporaries, among them Sir Walter Raleigh, François, Duc d’Anjou, and Robert Devereux. The commissioned score by Martin Yates, written for cello and baritone in a modern reimagining of a typical Tudor-period ensemble, re-creates the structures and harmonies of music by the great Elizabethan composers, including John Dowland, Thomas Tallis and Thomas Morley. Acosta looks spiffing in the various waistcoats that Fullerton gives him. If he struggles to differentiate except in pretty broad brushstrokes between Elizabeth’s longtime favourite Robert Dudley, the lusty François, duc d’Anjou, and the ultimately seditious Earl of Essex, some of the blame here must also go to Tuckett. But Tuckett’s steps do allow Acosta to show off plenty of physical bravura, and his Walter Raleigh is utterly hilarious. This ridiculous, libidinous, pelvis-thrusting buccaneer affectionately channels the late Rik Mayall’s wonderful Lord Flashheart (from the Elizabethan-set second series of Blackadder), and provides welcome light relief. Middleton has assembled a fascinating collage of voices – some of them reverent, some gossipy, some antagonistic – that present the story of Elizabeth’s reign from an illuminating range of perspectives. The actors circle tightly around Yanowsky, as she reacts with intimate, humorous or fearful emotion to their different tones of voice, giving us a strikingly visceral sense of the tightrope Elizabeth walked in maintaining her crown. Elegantly performed and intelligently crafted, this is dance theatre of quiet but passionate depth.